EDINBURG — During his first season with the RGV FC Toros last year, Pharr native Omar Ontiveros was limited to just 172 minutes across three appearances because of an ankle injury. Back to full strength for 2018, Ontiveros has already eclipsed his playing time from last season, logging 270 minutes across three matches. The defender also netted his first career USL goal, sending a soft, looping header into the left side of the net during RGV FC’s match against Portland Timbers 2 on April 18. The Toros are off to a difficult start to the year, holding an 0-3-2 record entering a home match against Orange County SC at 7 p.m. Wednesday. But from an individual perspective, Ontiveros said he has been pleased with his performance and the strides he’s made in his second season. Ontiveros said his second year has been easier than his first because he has a better understanding of the team, league and crowd. Despite playing in just three of the RGV’s five games, he ranks second on the squad in clearances with 17 and third in interceptions with nine. Echeverry has talked since the preseason about the challenge of selecting four starters from a talented group of options on the back line. 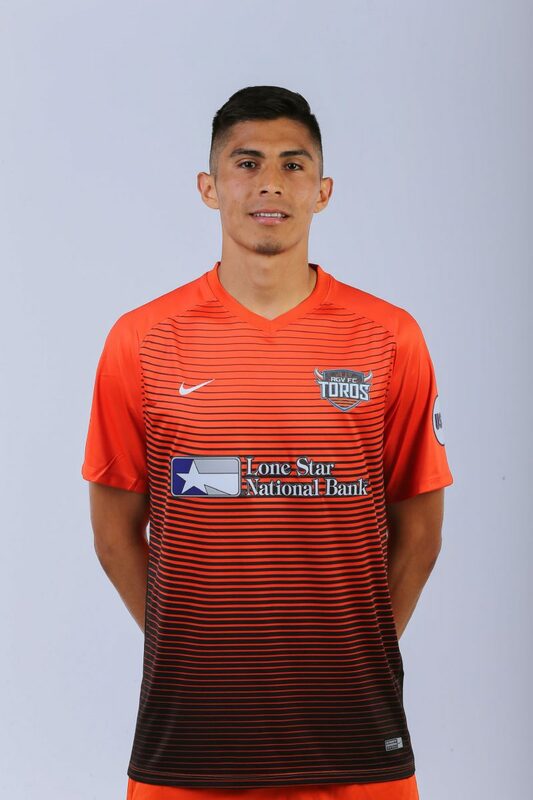 Seven different players listed as defenders on the roster have seen the field for the Toros, and Echeverry said that even 19-year-old Robert Castellanos has proven that he deserves to play in the near future. “None of these guys are really letting up,” Echeverry said. For Ontiveros, the biggest key to continuing to carve out a consistent role is coming out of his shell vocally to better organize his teammates from his position as a central defender. Echeverry said Ontiveros has the game sense to provide that presence, and bringing that quality out of him has been a primary focus. Ontiveros lived in the Valley until he was about 14 years old, at which point he moved to Bradenton, Florida, to enroll in IMG Academy. After three years, he joined the U-20 squad of Mexican club Santos Laguna for about six months, then spent a year and a half with Club Sportif Grevenmacher in Luxembourg. He signed with the Toros on May 5 last year following an open tryout in January. Ontiveros said representing the Valley at the professional level is a great opportunity.